A Memorable Hike to Changabang Base Camp: A For the last three years, in what has become an annual pilgrimage, some friends and I have headed to the Himalayas to explore, and challenge ourselves while traversing the wilderness. Some of us want to escape to a remoteness where, for a fortnight, we aren’t troubled by the buzz of our internet-connected mobile phones that herald yet another email or deadline. For others, it is an opportunity to see the spectacular beauty of the mountains. For me, it is both. 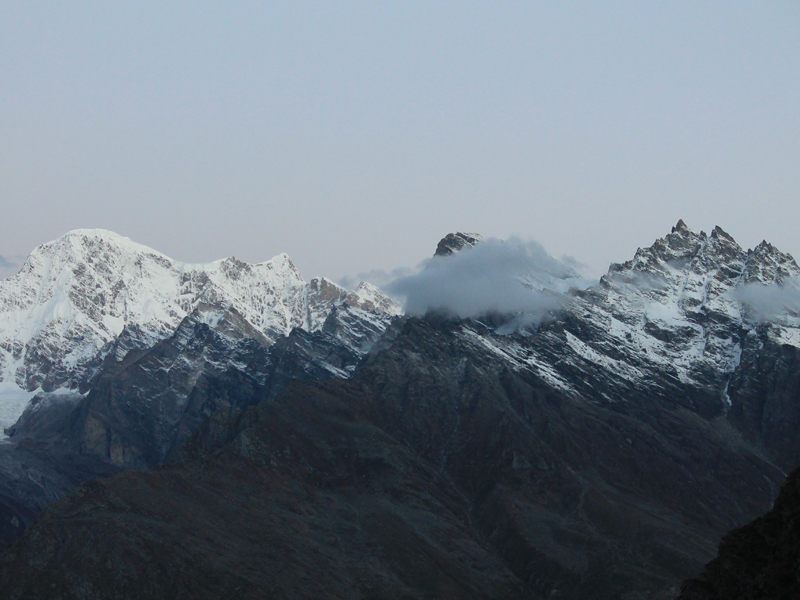 In 2011, we trekked to the Kuari pass in the Garhwal Himalayas in Uttarakhand. You can see almost nothing until you reach the pass itself. Then, it is as if the mountains have pulled open a screen that hid the actors of a play from view. I remember being taken aback by the splendor of the vista. We could see several peaks, including Hathi Ghoda Parbat, Mukut Parbat, Mana and Rishi Pahad, and the most imposing of all, Dronagiri. Though the missus and my friends constantly remind me, it is in the rough country amidst towering mountains that I am really reminded of my own insignificance. The brilliant view and the mountains heightened my own sense of irrelevance in the overall scheme of things. These proud and daunting peaks in their white theater wove a contrasting story of beauty, fragility, strength, and continuance. I realized this magnificence must be preserved and I resolved to care more for our fragile ecosystem. The Kuari Pass trek proceeds along the beautifully laid out Curzon trail, through remote, charming Himalayan villages. It was autumn, so the trees dotting the paths were clothed in lovely shades of orange, brown and red. Occasionally the stunning snow-capped white or the imposing brown of a mountain peak was visible against the clear blue canvas of the sky. We saw the majestic Nanda Devi (7817m) and Trishul (7120m). This annual pilgrimage gives me the opportunity to challenge myself. I run, but running does not come naturally to me. I’ve had to work hard at it, and at everything I do. The mountains remind me to continue. It is as if they tell me, “If you need to get to the top and if you want to, you and only you must do the hard work. You are responsible. Don’t look for excuses. Don’t constantly look to others to lend you a helping hand. You need to do the hard work. Yes, you.” I remind myself of this constantly, but there is no place this message seeps better in than in the mountains when I am on my own, totally exposed and vulnerable. Our trek in Ladakh last year was a completely different experience. The mountainous desert presents different landscapes and challenges. Dehydration, the lack of tall trees to protect from the harsh environment, the cruel winds that slap your face with dust, and altitude sickness meant that only a few of us made it to the top of the Stok Kangri mountain, at about 6200m. This year, in October, we returned to the Uttarakhand Himalayas. I love these mountains, though I wish Joshimath – from where most treks commence – was as much a trekker’s paradise as Leh is for treks in Ladakh. Joshimath is an unremarkable town, with very little to offer by way of interest. It is neither charming nor peaceful. It is hustle and bustle, car fumes and horns. It is perfect if all you want to do is to use the town as a reminder of why you must escape to the hills as quickly as possible. 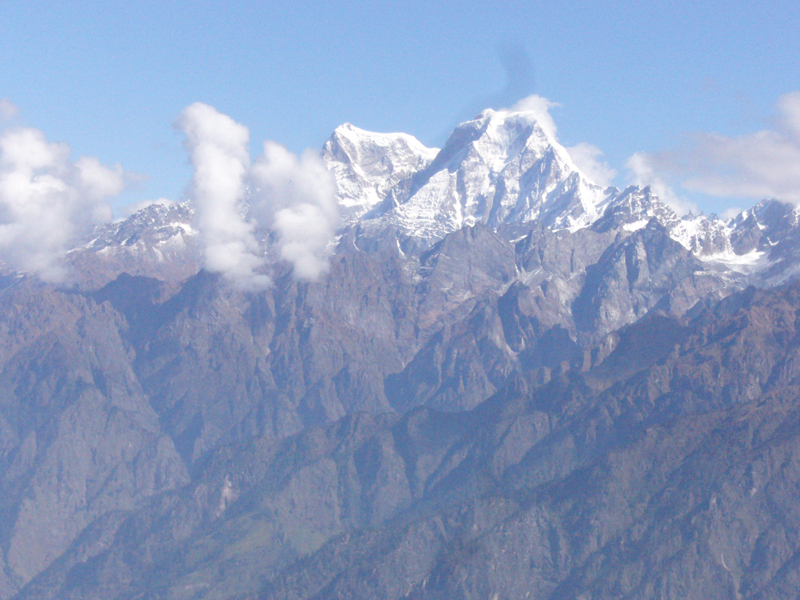 The peaks of the Garhwal Himalayas always seem to carry secrets and hope. Hope that despite the devastation and destruction we see every day, and the erosion of natural resources, these mountains will stand strong and constant. The confluence of the elements is wonderfully played out here. The rising sun paints the snow-capped peaks with a golden glow. Despite the low temperatures and the unbelievable crispness in the air, the sun warms the meadows (or “bugyals”) and valleys through which we When night falls, it is quick and it becomes incredibly cold. On our first day, we planned to escape from Joshimath by driving to Kedarnath and back. This was to prepare and acclimatize ourselves for the high altitudes we would face later on the trek. But the road to Badrinath and Kedarnath had not reopened after the June floods. 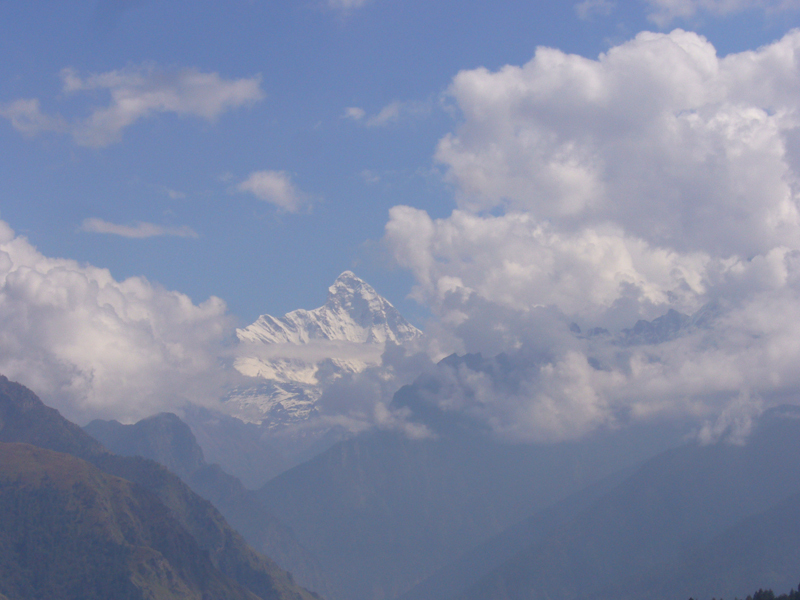 We decided, instead, to set out from Joshimath, trek past Auli to Gorson and return. We climbed through lush oak forest and bugyals, mostly in the gentle rain, hoping ardently to catch a glimpse of Nanda Devi. This peak has a sharpness and yet provides a watchful eye and a welcoming embrace to anyone who wants to walk and marvel at the fabulous biodiversity around. But due to the mist that enveloped us for much of the day, we were unable to see it. Several people told us it would be unsafe and unwise to travel to the Garhwal Himalayas after the June floods that badly affected these areas. But I strongly feel it is at times like these that people in affected areas need us to support the work they do for a living. At times like these, we need to give them that assurance and work together through the havoc nature wrought on them. 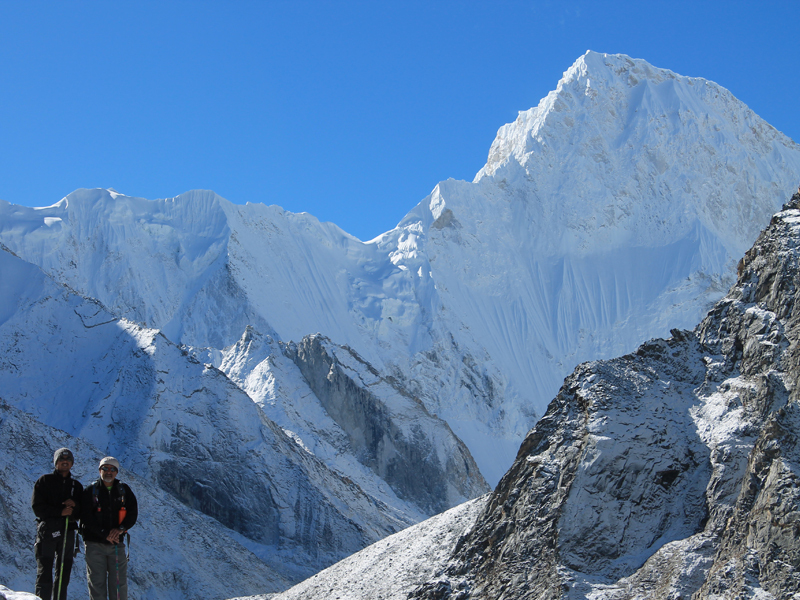 Our main trek was to Bagini base Camp, and from there to Changabang advanced base camp. The Changabang peak was our main destination. The trek is almost entirely along an extremely wide moraine meadow. It is pretty in some parts, but mostly quite tiring as the moraine rolls on for an eternity. Walking atop boulders is not a pleasant experience, especially when you have to do it for hours. Beyond the Dronagiri camp, which you reach on the second day of the trek, the walk is almost entirely along the Bagini River. There are also a few river crossings along the way. The river is not more than knee-deep, but flows quickly and is not easy to cross. Remarkably, my toes stopped hurting after I stepped into the river, and its ice-cold waters numbed my feet. At Dronagiri camp, the big mountains begin surrounding you completely. We had reached the camp the previous evening after trekking in poor light. Clouds surrounded the camp and we were unable to see what was around. So, the view the next morning stunned us. Several peaks, including Hathi-Ghoda, Trishuli, Monal, Har Deval, Dronagiri, were lit up by the rays of the morning sun bouncing off their snow-capped tops. Four people from our group fell ill while trekking from Dronagiri to Bagini base camp. They suffered from a mix of nausea, continuous headache, and fatigue. We had walked the whole day, but the moraine wouldn’t end. We trekked past what was called the “Bengali base camp”, which seemed a good place to stop. Our tired legs, and even more tired minds, screamed for respite. But our guide pressed on, and we walked in a daze. By the time we reached Bagini camp, at about 4400m, four of our group decided they’d had enough. They wanted to head down to Toli camp the next morning. Two of us, though, wanted to walk up to the Changabang advanced base camp. We decided we would do continue on, and return to join the others at Toli camp. The climb from Bagini base camp to the foothills of the Changabang Mountain is the most rewarding trek I have undertaken. Soft, fresh snow covered much of the path that took us up a long ridge. Our guide said we would catch the first glimpse of the peak at the top of the ridge. But no matter how much we walked, it remained far away. So much so that I started to believe it was a mystery that didn’t exist. I called it the “reclusive mountain” because, though we had heard so much about it, it just wouldn’t reveal itself. There was a mystery surrounding its very existence. The more we trudged up the ridge, the farther it seemed to get away from us. It tested us, our resolve and our determination. Then, after an eternity, Changabang suddenly emerged. I’d wanted to see what Murray saw, and I did. I stood transfixed, never having seen anything more inspiring, more threatening, more rousing and more protective. Not many people have scaled Changabang, and neither did we. But I thanked the mountain for having given me the opportunity to see such a beautiful sight. We walked closer to it for another hour until it felt like we could almost touch it. But after one last forlorn look at it, we turned back towards Toli. Moments like these are what draw me to the Himalayas every year. I need reminding that my purpose is bigger than my job, my savings, deadlines, my home, and retirement plans. I also need to be reminded of my own fallibilities. I believe it is important to feel insignificant and humble, and there is no better place for this than in the Himalayas. The thing about the mountains is that it is hard to give up and go home. There is no home to go back to. You can’t get angry, pick up your bat and ball, and trudge away angrily or despondently. You are there on your own, with your thoughts and resilience. You have to dig deep, build resolve and continue, and this is where preparation is important. 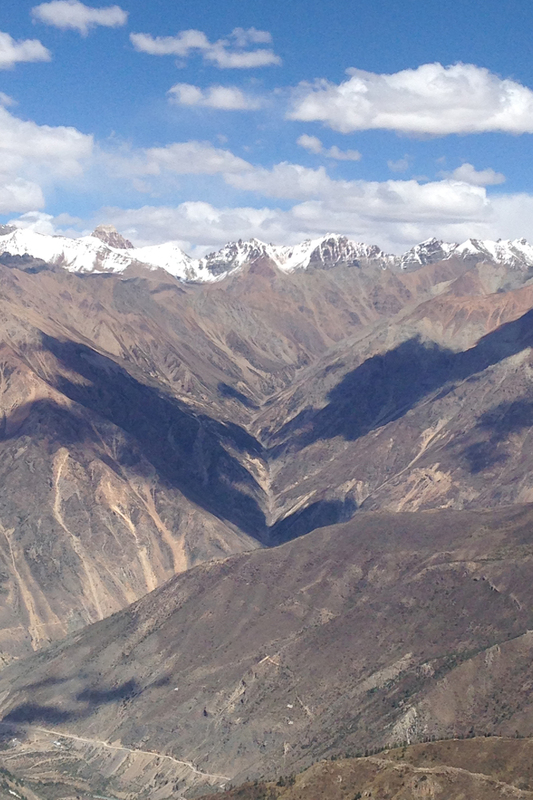 We continued our trek and, a few days later, reached Kala Khal, at 4500m. The pass was as beautiful as we’d heard it would be. We could see everything around for miles. We saw the range of mountains that marks the India-China border (near Nithi village), and army camps at Mallari and Bhojgiri down below, where we headed for our last camp. This trek was as much a test of endurance as it was a feast for the eyes. As always, I learned a lot about myself. 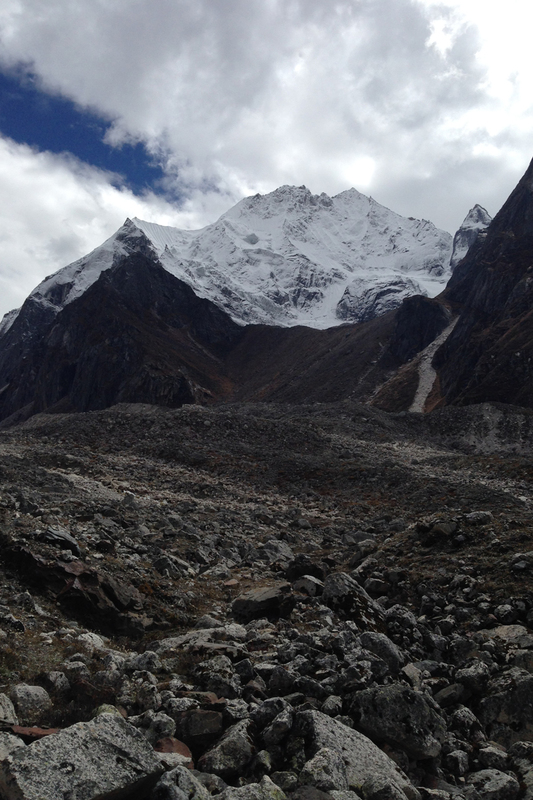 And catching sight of Changabang was my favorite moment of this trek. Changabang taught me a very important lesson. In an increasingly competitive world dominated by sellers and marketers, the one who shouts the loudest and longest wins. There is a constant need to trumpet your achievements more than the others. Changabang taught me the wastefulness of it all: it didn’t need to blow its trumpet, puff its chest and constantly announce itself to the world amidst a cacophony of drums. Its mere presence, its existence, was enough to mark its impressive history. It would continue to stand there: shyly and away from view, yet strong and defiant. We recently hiked to the Bagini Glacier Trek in April with 6 Hikers. I run this company called First Pilgrim (this blog) which organizes some offbeat treks in the Himalaya. You can contact me on +91-7799656664 or [email protected] for help in arranging this or advise about this trek.